When this book, written by Robert Thompson and Barbara Fritchman Thompson, arrived in my mailbox I couldn't wait to thumb through it. My initial impressions were that it was quite a cool book. I was actually late to work that day because I sat in my truck reading it. The further I got into it the more that I said to myself: "Why would you ever have to write observing advice again?!" Whenever someone asks you about an observing target all you need to do is simply point them in the direction of the Thompsons' book. 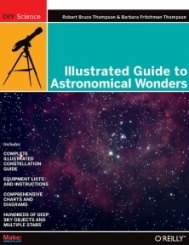 The Illustrated Guide to Astronomical Wonders is so complete that it will hold an easy to reach spot on my bookshelf. It is an excellent work suitable for beginners as well as accomplished observers. It contains well written descriptions and locator maps of many AL (Astronomical League) observing lists including clusters, nebulae galaxies, constellations, AL binocular list targets, double stars (my favourite), deep sky observing targets, urban observing tips ... the list goes on. The authors include comments on how to complete the numerous AL observing list certificates. The book engages the reader: included within the constellation guide descriptions are mythological tidbits and points of interest. Another plus point of this book is the reference to web links. The Thompsons also give informative purchasing pointers for "work horse eye pieces" and "good inexpensive binoculars", outlining the pros and cons of image stabilized binoculars. I enjoyed this well thought out and well written reference book - I am confident that it would prove to be a much coveted gift for your favourite observing partner.